Banana-cue ~ I Can Do That! 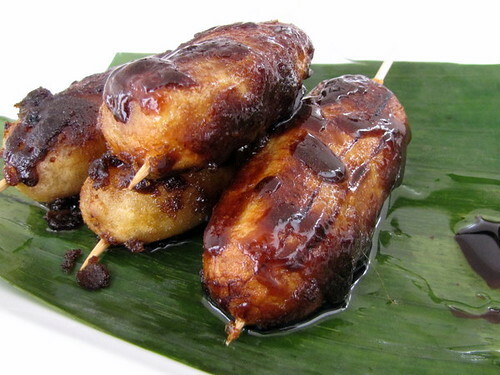 Banana-cue is a favorite Filipino street food made with cooking bananas called saba. Despite its name, banana-cue is not grilled; they are deep-fried with brown sugar and skewered in bamboo sticks for portability. I prefer banana-cue cooked until the sugar caramelizes and becomes hard and brittle. Heat oil in a medium pan or wok and fry bananas for 2 minutes. Add brown sugar and cook, stirring constantly, for 2 to 3 more minutes or until sugar has caramelized and bananas are evenly coated. Skewer each banana and serve immediately while still warm and crunchy. i think it's about time i try cooking this myself! pero i want to try turon with langka...i wonder if mas mahirap lutuin un? Ohh I wish I could find saba banana. I love love this take. One thing I won't see here are our plaintains :( only in bottles, sweetened lol. The hubby one time made use of ordinary bananas, that's the chinese version and served it with honey :) will post it soon. Enjoy this sunday and do have a lovely week ahead! hi oggi - i love when the sugar is caramelized - there if a Filipino store nearby that does this snack occasionally. they also make turon and i just love the hard, crackly sugar!